Those are EXTREMELY useful, cheers! Interesting to see how *blue* the rest of the hull is compared to the saucer in those scans. They really bring out the hull plating pattern. 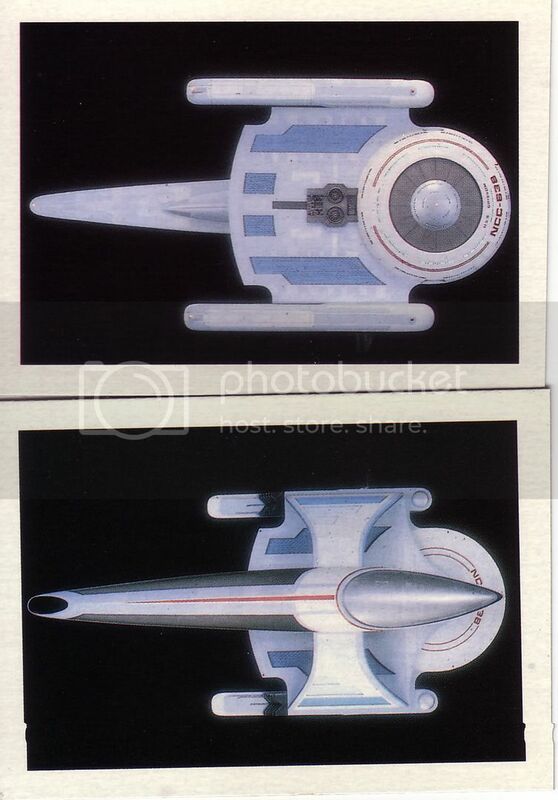 The scans also show something I've never noticed before - the back end of the ribbed part of the nacelles have an inward notch. I always thought that they were straight across. Those shots are very cool. So by my count, there are 4 decks in the bigger part of the saucer and 2 in the bulge on top. It also look slike there are rooms surrounding the bridge on deck 1. Seems to be 4 decks in the lower part too, not counting the top rounded part which seems to be deuterium storage or something. The rooms surrounding the bridge would presumably be a conference room and captain's ready room or permutations thereof. Ah, good a aft view! It's really hard to find any details on whatever that tail feature is. Oddly enough, in the Christie's auction photos that Starship Freak was kind enough to email, that bit has been blanked off. Anyway, here's the latest progress. A few comments on contours, if it's not too early. 1. 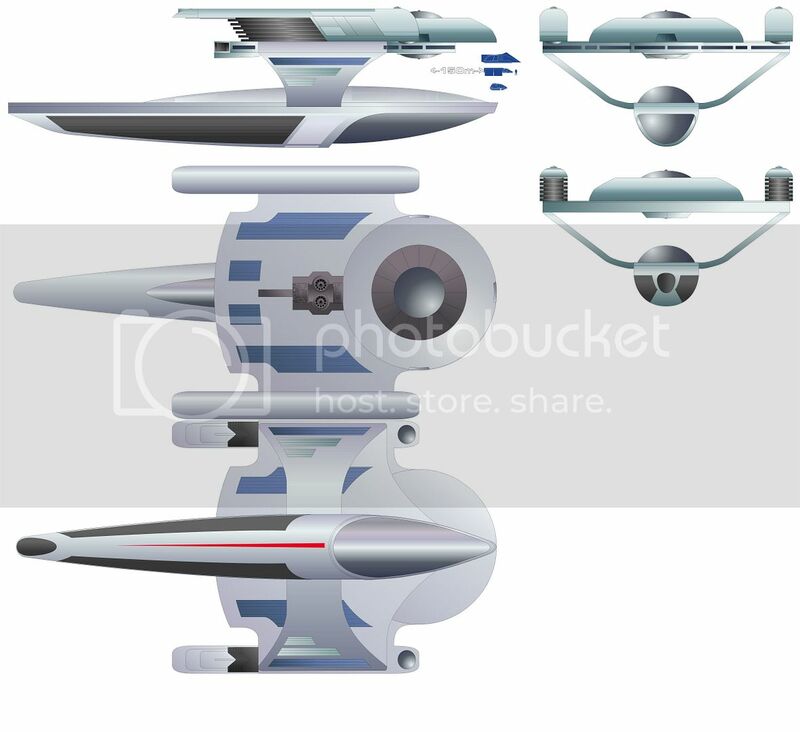 On the top and bottom views, the fronts of the nacelles should be more rounded. They appear to be half circles whose curves match the domes underneath. 2. The little fillet connecting the front of the nacelle to the primary hull dome should come out perpendicular to the nacelle. Yours start curving immediately towards the front of the ship. 3. The fillet appear to meet the primary at the rear edge of the door on the side of the primary hull. 4. On the bottom view, the curved line from the front of the pylon to forward of the center of the dish should begin to curve forward immediately. It does not have a straight perpendicular section as it leaves the nacelles. So, you've reversed the characteristics of the curves of the fillet and of this part. 5. The narrowest-appearing point of the fillet (mentioned in 3) is the point that it begins to curve forward. 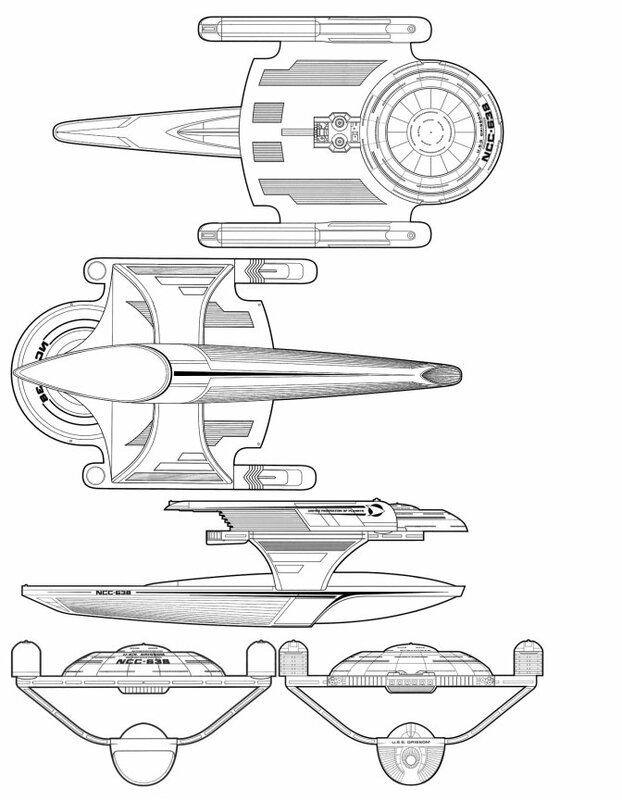 On your drawing, it's narrowest when it leaves the nacelle. This would be fixed by adusting the curves of the fillet and of the pylon. This is why I hate drawing canon ships! 6. The the cutout of the most-outboard pair of blue panels should have a sharp corner, not a curve as you've shown. Bloody hell. If I ever manage to get this right, you are SO putting it in the Museum! 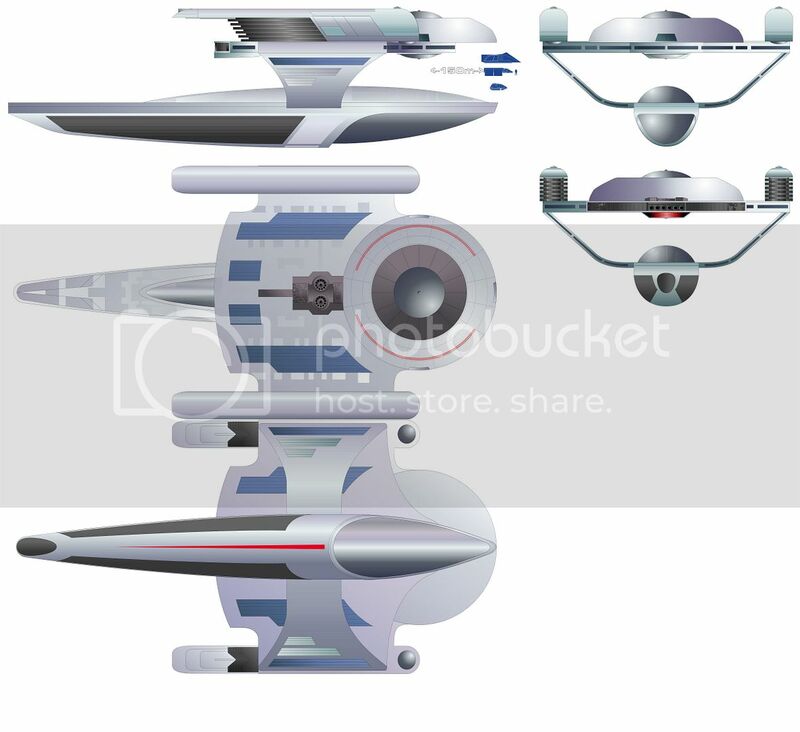 The Oberth schematics at Ship Schematics are actually pretty good. Yeah those were my rough starting point, though you may notice it's missing the ventral sensor dome. I found my set, and Masao was too quick on the draw for me. I thought there were two other view but was wrong.